We were traveling back from NY and landed in the Carlisle PA area. In searching on line we found a place called "Western Village" off I81 and not far from Hershey. They're only a short distance from the highway and neatly tucked back behind a residential neighborhood. This turned out to be one the nicest and cleanest places we've found for a long time. I strongly recommend this place to any of my fellow travelers. Thanks for posting Dave!! Good info for the Hershey show. I know there is the "On the road camping forum" but would be nice to have one that just lists info on campgrounds that are big rig friendly and some basic info without endless discussion. Would be a big help on the road somtimes. If we are in an unfamiliar area we just pull out the KOA book since most are easy to find and pet friendly. Our very first outing in our Redwood was to Western Village. I think I had a tight gripe on the door handle for the entire 1.5 hour ride there. We've come long way. I thought it was a bit dreary and basic when we were there. Then again, it was March. Everything I this neck of the woods is dreary in March. May have to give it another try based upon your recommendation. 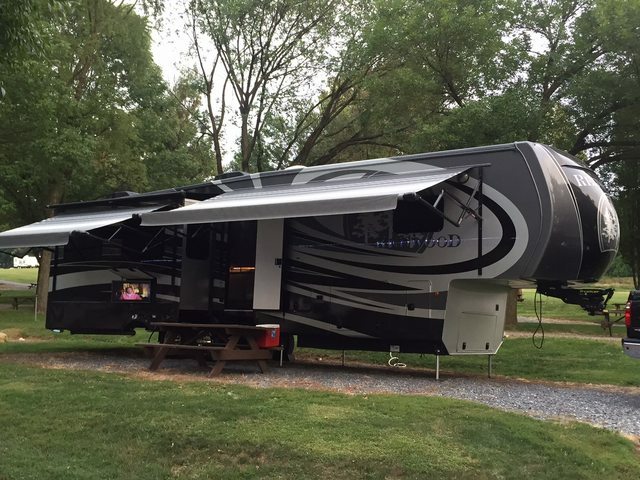 In addition to having a mobile app (and website), RV Park Reviews has a Facebook page/group where members can post info and pictures about parks. Gives a lot of ideas for places to visit. I also use the app religiously when we travel to gather just the type of info you're looking for. And I like the reviews, most of which are spot on. Have to say "most" because I'm still scratching my over the one review I read for Endless Caverns near Luray, VA. Woman complained that the manager failed to tell her that there were snakes in the area. Mind you, the "area" consisted of mountains in Virginia. How odd that there could be snakes. We didn't see any snakes, but did see a good deal of chipmunks frolicking happily about. We stayed at Endless caverns a few years back and really enjoyed it! We did not see any snakes , so I guess there are none in that part of the mountains! But we DID get the best fried chicken from a gas station!!!! and ice cream from a back shed !